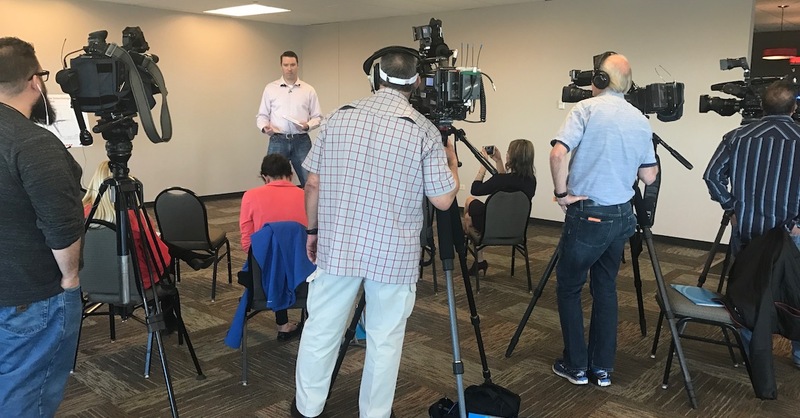 The I-25 and Arapahoe Road Interchange Reconstruction project team hosted a press briefing Wednesday, March 22. With various closures planned throughout the spring of 2017, CIG and the Colorado Department of Transportation (CDOT) team decided a press briefing to cover these big closures would be best. Pulling off a successful press briefing involves a fair amount of behind-the-scenes work. This included developing scripts for the speakers, finding a location for the briefing, sending invitations to the media, developing media packets and working with the media to secure useful visuals. The Denver South Economic Development Partnership located the site for the briefing, complete with a full view of the project. With help from Kraemer, CIG, CDOT, Denver South and others, this briefing was well organized and full of information from project engineers.